The word university comes from the Latin universitas magistrorum et scholarium which means a community of scholars and teachers. They gathered together in search of the truth. Its medieval Catholic origins speak of a unified worldview that encompassed all sciences and disciplines. It embraced all that is physical, from the stars in the sky to the core of the earth. It also involved all that is spiritual especially the cultural development and sanctification of man and society. 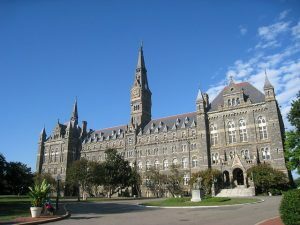 Thus, the university was an essential part of Western Christian civilization. This is because human action normally takes place in accordance with the religious and philosophical doctrines that dominate history. It was natural, then, that universities study the achievements of the Western civilization from whence they sprung. These questions are important because they go to the core of man’s existence as a social being. For decades, those matters were discussed in courses that eventually came to be called “Western Civilization.” Since the early nineteenth century, Western Civ1 (as abbreviated by later generations of students) was usually assigned to the History Department. In today’s politically correct climate, Western Civ has all but vanished from the modern university. Western Civ stressed the way that several cultures – Greek, Hebrew, Roman, and others—contributed to the development of the single Western Civilization that took form as Christendom. Under the guidance of Holy Mother Church, ideas from these ancient cultures were molded around the core of Christianity and produced a culture that was principled, dynamic, just, and humanitarian – in the best sense of each of those terms. While flawed like all things human, the overall story was one of progress in terms of the good and attempts to limit the bad. Once it was firmly rooted, Western Civilization developed and spread through the world as it moved through feudalism to Renaissance, the Protestant revolution, development of nation-states, Enlightenment, French Revolution, and the Modern Era. The course usually ended sometime in the early twentieth century with one of the two World Wars. This was the grand canvas of history, the central narrative of civilization itself. With this series of guideposts firmly planted in the mind, they could be embellished by the more specialized courses that formed the rest of the curriculum. Individual students would go into myriad directions, including the sciences, philosophy, mathematics, technology, or some branch of history. Underneath it all, however, Western Civ was the organizing principle of the university. As the only course in the humanities required for all, it ensured that there was a vocabulary that was commonly understood by all students, regardless of their major. Without it, the academic world has become significantly more fragmented. When taught well, this narrative could be truly inspiring. Grappling with the great minds of the ages prepared students for the adventure of greater knowledge as they moved through the university. Exposure to the wealth of knowledge could be thought-provoking to students and gratifying to professors. However, many students disliked the class. Most complaints amounted to some variety of the argument that Western Civ. wasn’t “practical.” It rang hollow to students eager to get down to the “real work” of their chosen disciplines. As the academy became more specialized – one commentator saying that professors came to know more and more about less and less – the course also came to be sloughed off onto junior faculty members, who disliked teaching it. Until the university became a popularity contest that granted degrees, that objection mattered little. Even in a weakened state, the narrative was still essential. The professors knew why Western Civ was required, and the intelligent students would come to understand in good time. However, Western Civ was doomed to be a victim of the “do your own thing” spirit of the sixties. Two more decades would pass before it would fall victim to the overheated rhetoric of relevance. If one had to pinpoint its downfall, that date likely be January 15, 1987, when Jesse Jackson, led a group of protesting students at Stanford University with the chant “Hey, hey, ho, ho, Western Civ has got to go.” The Stanford administration raced to admit defeat. Other universities followed suit. What chance did the philosophy of Aristotle and Saint Thomas Aquinas have when met with the searing logic of such revolutionary happy warriors? Western Civ had to go, said the disaffected, because it glorified the evil done by Western nations to Africans, Asians, Native Americans, women, and almost everybody who was not Western. Thus, the place of Western Civ was taken by other coursework. For example, at The Ohio State University, today’s history students can take courses like “Gender and Sexuality in China,” “History of Medicine and Public Health in Latin America,” and “Comparative Slavery.” There are courses in more conventional areas, but the requirements for a History major at OSU does not include them. Western Civ is not only not required, but it is also not even recommended strongly to history majors – and not suggested at all to anyone else. Without Western Civ, the university is rapidly becoming a multi-versity. Every year, each department disgorges graduates who know what its faculty thinks is important but knows less and less about anything else. Many of those who will eventually assume positions of opinion leadership in our society as teachers in our schools, or as participants in public life, are no longer learning about their civilization’s great story, its triumphs, its vicissitudes, and its singular role in transforming the human condition. What is the future of a civilization whose heirs have largely become blinded to its history? And what can we do to revive the study of Western Civilization? Those are weighty questions, and not easily answered. Some schools have experimented with “Great Books” programs for interested students. This approach has borne some fruit, but it is not nearly enough. The rest of the student population has no cultural common ground which leaves them wandering in the dark. A return of Western Civ would take extreme acts of will on the part of the universities and their history professors, and there is little reason to believe that will happen soon. Indeed, the vanishing Western Civ classes could lead to the vanishing West. This entry was posted in Featured and tagged college, fall of western civilization, multiculturalism, school, student, university, western civilization by Edwin Benson. Bookmark the permalink.